The floor under your bathtub is the main element in supporting the tub. Therefore, you'll want to keep that floor in peak condition. The most common reasons to replace this floor are that it can no longer support your bathtub and the wood has become rotten. 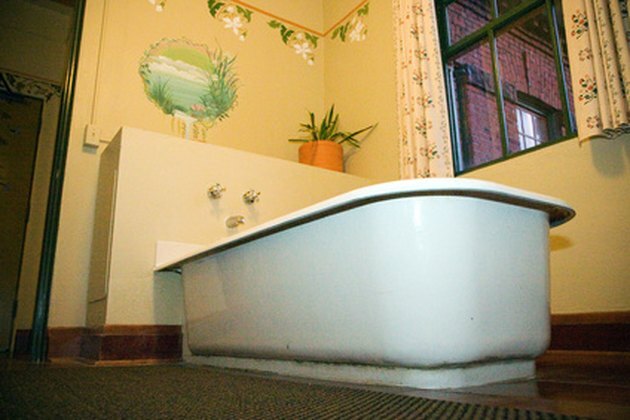 A rotten floor, a leak or even termite damage are some of the explanations why the bathtub floor can no longer provide a strong support for your bathtub. Take out the rotten floor under your bathtub. Disconnect pipes of the bathtub. Cut into the wall above the tap of the tub to gain access to the pipes. Turn off the water supply. Unscrew the tub pipe connection using adjustable pliers, and then loosen the nuts that attach the bathtub pipe to the overflow pipe. Remove the tub from the walls between which it is sandwiched. Pry the tub with a pry bar and pull it until the tub is free. Measure the area where you need to replace the rotten floor. Mark the perimeter of the damaged floor using chalk. Cut away the damaged area. Cut along the perimeter that you marked with a circular saw. The cut should not be too deep so you won't cut through the structural floor of your bathroom. Make sure that your cut is straight so that it will be easier to install a new subfloor. Remove the damaged flooring. Pry the damaged floor off with a crowbar. Use a chisel and hammer to pry off the floor from corners and the areas near the wall. Clean the area where you will install new floors. Remove the debris from cutting the damaged area. Sweep the area with a broom to remove the dirt and dust. Cut oriented strand board (OSB) to fit the damaged area of the bathroom floor. Use the measurements you took earlier to cut the OSB. Lay the OSB on the cut area of the floor. Secure the board to the floor with drywall screws and a drill. Screw in every 2 inches on the edges of the board. Seal the seams of the floor with construction putty. Allow to dry several hours before applying any other finish or replacing the bathtub. Put back your bathtub and reconnect the pipe lines.